At the old Mill in McCloud California, a historical lumber town located at the base of Mt. Shasta. In 1892, A.F. Friday George built the first mill located in what is now McCloud, but it failed because of the difficulty of hauling the lumber over the hill by oxen. In 1897, the town of McCloud was finally established by George W. Scott and William VanArsdale, founders of the McCloud River Railroad Company. The railroad made it economically feasible to transport the lumber to more populated areas. The two men also purchased many of the small failed mills including the old Friday George mill and named it the McCloud River Lumber Company. Thus began the lumber company town of McCloud. The Mill is now owned by McCloud Millworks, it's an amazing site with a whole bunch of history. 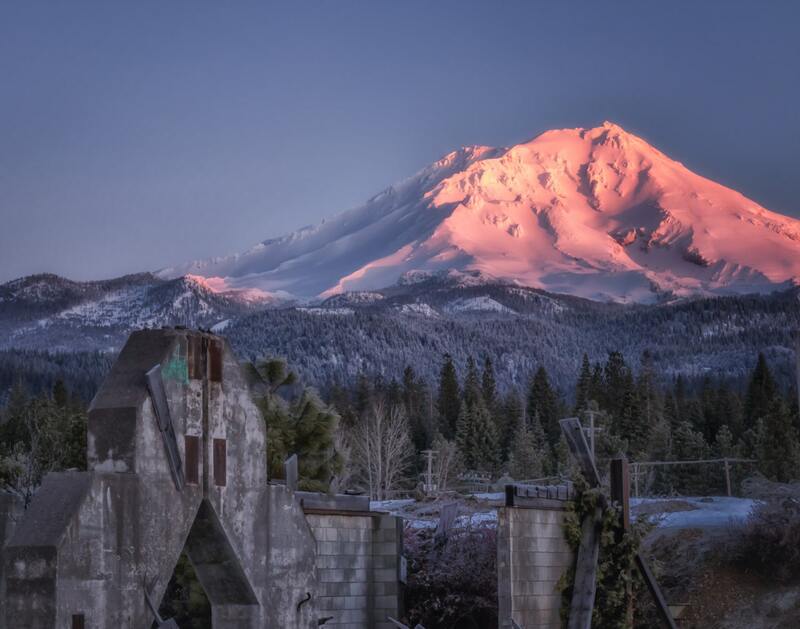 Mount Shasta is a potentially active volcano at the southern end of the Cascade Range in Siskiyou County, California. At an elevation of 14,179 feet, it is the second highest peak in the Cascades and the fifth highest in California. Mount Shasta has an estimated volume of 85 cubic miles, which makes it the most voluminous stratovolcano in the Cascade Volcanic Arc.